I remember playing with those plastic disks with the pencil holes in them. How precise and careful you had to be to exert the perfect amount of pressure to keep the cogs of the spirograph from skipping. Use a craft knife to cut off the bottom 1/2 inch of a recycled plastic bottle. With hot glue, attach glue nozzle to mouth of bottle, adding extra glue around bottom rim of nozzle to create a tight seal. For added security, wrap seam in electrical or duct tape. To reinforce bottle where support strings will be tied, fold three small tabs of tape in an equidistant configuration on the cut end. Punch a hole through each tab of tape (and the plastic bottle) with 1/4-inch hole punch, thread a long piece of twine through each hole, and secure in place. Bring all strings together and tie in a large loop about 1 to 2 feet from the bottle. Thread loop onto a large paper clip. Tie a piece of twine to the top of the tripod so that it hangs down into the center. Tie a loop at the bottom end of the twine and attach pendulum with paper clip “hook.” Adjust height; the nozzle should be at least 1 inch away from the paper. Mix one part tempera paint with one part water. Paint should run freely but should not be too watery. Add more paint or water if necessary. Strain paint and water mixture through sieve to remove any lumps and prevent the pendulum nozzle from clogging. Place paper under tripod. Make sure nozzle is closed and carefully add paint to pendulum. Pull pendulum off to side of paper, open nozzle and allow paint to run freely. 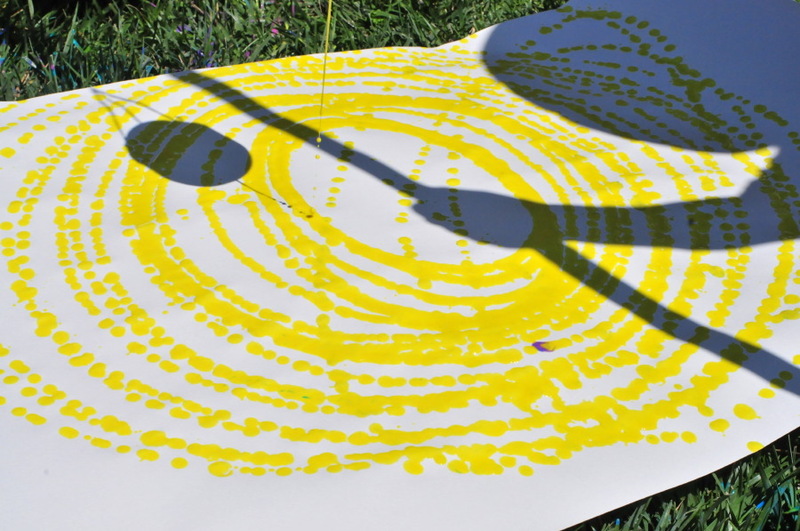 With paint flowing, let pendulum swing over paper, changing direction as desired. To stop flow of paint, place finger under paint nozzle and twist to close. Allow artwork to dry flat. Teacher Tom tried it out too! with preschoolers. Check it out here.